Finally, after a season of blowouts we saw some close games on a Friday night. Wilson and Jordan battled in a classic, while Compton and Millikan fought it out. Poly took care of business at Cabrillo. The Moore League is hitting its stride. Love Long Beach, food, and drinks? Click here to scroll through our food’n’drink archives. Say it with us, Long Beach: Bixby Knolls will soon be known as Brewery Knolls—and Liberation Brewing Company (LBC), taking over the old 98 Cents Store at 3630 Atlantic Ave., is leading the way. LBC, having just started its official first brewing session on March 22, officially opens today, offering up a space that keeps its strictly beer—no grub—and offers up some solid brews that include amber ales brewed with Rose Park coffee, classic IPAs, cream ales, and more. It’s hours today will run from 3PM to 9PM, Friday from 3PM to 10PM, Saturday from noon to 10PM, and Sunday from noon to 6PM. Joining LBC will soon be Ambitious Ales, taking over the (already missed) Tuttles Camera space at 4019 Atlantic Ave. and set to open later this year—and what each brewery brings is a more beer-centric flavor to Bixby Knolls, joining other existing staples like Rasselbock and Dutch’s BrewHouse. 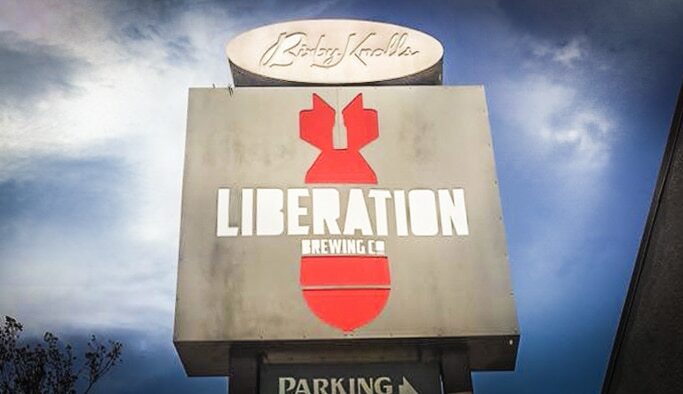 Liberation Brewing Co. is located at 3630 Atlantic Ave.